You'll be £16.99 closer to your next £10.00 credit when you purchase Battles of the Marne & the Aisne. What's this? While the Allied Generals were nearing panic as the Germans approached Paris, Marshal Foch quickly realised the German intent and that the Schlieffen plan was unravelling. In a master piece of military diplomacy he persuaded Filed Marshal French to join the Attack on the exposed flank of the Germans as it wheeled to the east of Paris. The battle was monumental and indeed a miracle, with the British playing a key part alongside the French in halting the German advance and driving them back behind the next river – The Aisne. Here, the next Allied attack crossed the river and up onto the open ridges of the Chemin des Dames. The Germans held them and Field Marshal French ordered them to dig-in as a temporary measure but the line moved but little here in the next four years. With neither army able to make headway against modern small arms, the machine gun or quick firing artillery in a conventional frontal battle, the armies raced to redeploy into the uncontested ground north to the sea. Here on the La Basse canal and north to Armentieres and the Belgian city of Ypres both the Germans and the BEF attempted to advance but the result was a four hundred mile line of trenches from the Swiss frontier to the North Sea. 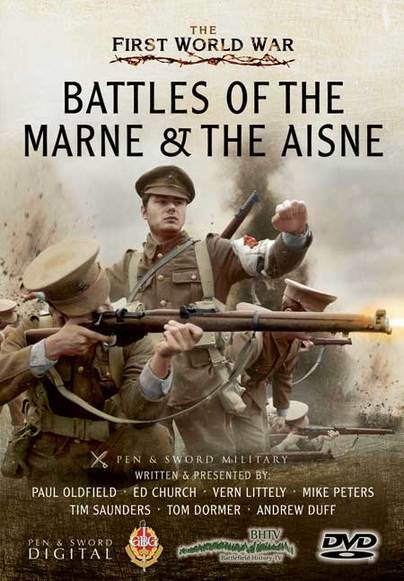 Battles of the Marne and the Aisne continues the story of the early part of the 1914 campaign, following on from ‘Nery and the Retreat from Mons.’ It examines the ultimate failure of the German Schlieffen Plan, and how the German Army then retreated to the Marne. The film does a good job of setting out the strategic context as well as the day-by-day events of this period. It examines the difficulties faced by the BEF in crossing a landscape characterised by wide flat plateaus pitted with steep wooded valleys down to the rivers – terrain that lent itself perfectly to German delaying tactics. The Germans deployed well thought out defensive positions, including use of deceptive to make the British think there were more troops than there actually were. The BEF at this point was essentially plugging the gap between the French armies, but the film highlights the professional tactics used by the Regular army in response to the German defence. The role of the RFC is again examined; their reconnaissance showed the Germans were not intending to dig in on banks of Marne, and I and II Corps were quickly able to cross in pursuit over intact bridges. However, on 9th September the RFC also identified a large German formation – this was misinterpreted as threat and I Corps were ordered to dig in, so failed to exploit their advantage. The role of the Royal Engineers in constructing pontoon bridges and facilitating the supply of ammunition is also covered. At the Aisne there was a lack of RFC observation due to bad weather. There was also difficulties finding suitable crossing points, and the well-sited and more numerous German artillery posed a threat to the troops trying to cross and secure bridgeheads. The Chemin des Dames proved to be difficult terrain for the British artillery to provide support. The troops began to dig in to lines that would not change much over the course of the war. Ultimately the film concludes that the battle of the Marne was the turning point of 1914; the Germans were overstretched, plagued by problems of ineffective command (Von Moltke was overcome – isolated and finding it difficult to command as he was so far away), an exhausted army, logistical problems, and low morale. Talking about the action from where it took place enables the viewer to understand some of the geographical and logistical challenges the BEF faced in 1914. The maps are clear and instructive, the presentation is enthusiastic and assured. There is also the important assistance that comes from former soldiers with an eye for the terrain which shapes the progress and outcome of land battles. Another splendid DVD.